Just as expected, there was a bunch of drama surrounding Bobbi Kristina's funeral on August 1. In typical Brown/Houston fashion, somebody had to get kicked out of the service. 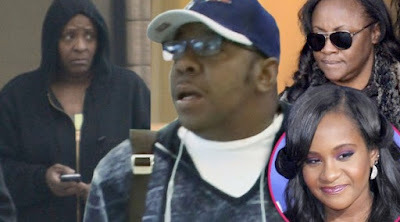 Bobby Brown was given the boot at Whitney Houston's funeral, and this time around it was his sister, Leolah, who was told to leave the premises. As soon as Pat Houston was about to speak during the service, Leolah screamed out, "Pat, you know you are wrong for this!" Apparently, instead of flowers being sent to the funeral home, Pat asked that people donate money to her charity - a charity she will profit from of course. This ticked off the Brown family and you know nutty Leolah is never one to hold back. And then, things got worse. Just hours after the funeral, Bobby's new wife, Alicia Etheredge, was rushed to an Atlanta hospital after having a seizure. Alicia just gave birth to her second child with Bobby less than a month ago. This is all too much!